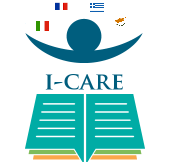 Our project objectives dictate the kinds of research methodologies we have to use to underpin our work and methods we use in order to collect, analyze data and reach the targeted populations .The objectives of I-CARE is to provide a. Free Access to Open Educational Resources in four (4) languages, b. ICT, soft and basic knowledge and skills to formal and informal caregivers. !n order to achieve these objectives which are both focusing on practical issues of caregivers' frequent problems (problems to access to the market, problems of daily care etc) the project will include five (5) intellectual outputs and different activities. !n order to achieve these objectives which are both focusing on practical issues of caregivers' frequent problems (problems to access to the market, problems of daily care etc) the project will include five (5) intellectual outputs and different activities. IO 1. Report on practices and skills identification of caregivers (responsible UoA): During this first stage of the project, the Universities of the consortium will build a solid methodology for the whole project and will create a large database of good practices, literature review, innovative educational tools. The activities and outputs of this IO will be used for the needs analysis of the following IO. IO 2. Training methodology for dealing with knowledge, skills and core competences of caregivers (responsible PFPF): In order to be able to better understand the focus groups and their respective needs, a qualitative research will be held. The evaluation process during the implementation of the activities will be conceived by all the partners. IO 3. Learning and training objectives and content (responsible CNRS): This phase of the project is dedicated to adapt and pilot the training content in every country ,and then to test and validate it by the learners groups.